It's that time of year again. Days getting shorter. Good to have lights on your bike. 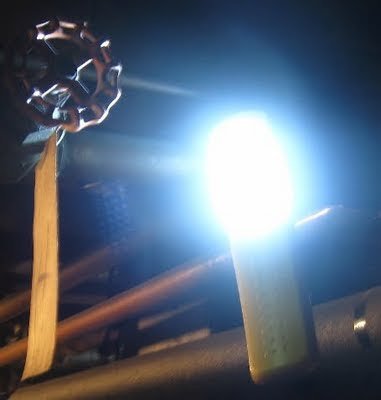 This bright wand full of LEDs runs on 3 AA batteries. It's not really designed for bikes. I got it at Fred Myers several years ago for only $20. Bright and handy. It's actually a shop light. Designed to hang among pipes, or whatever. There's a retractable hook at the top. 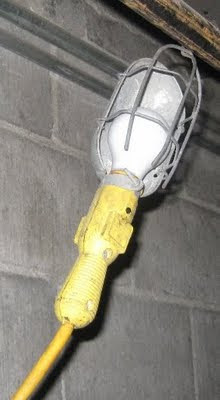 Remember old shop lights with the dangling cord? 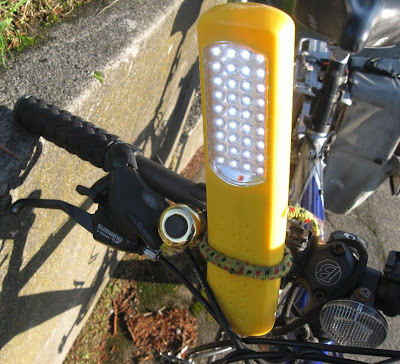 LEDs make it easier. Less worry stumbling over the cord. Bright light runs maybe 3 hours on one set of batteries. This can't be much of an ad for the light company, however. All I see is a sticker on the bottom saying "the designer's edge." Behind battery compartment door, the type is in German. Who made it? Oh, I just found out. The Designers Edge lighting company. 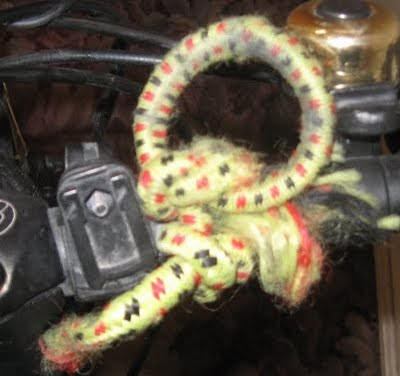 I made a loop from bungee cord. Stretchy so it's easy to shove light into stretchy circle of cord to be held with friction. Light for only $7.95 in bucket at grocery / hardware (everything) store in Rainbow, Oregon. The only store in town (town? ), but it had what I needed including a bucket with these LED shop lights. Wow, the price has come down. Got my first shop light of this style back in 2008 for $20. This bucketful had them priced at under $8 apiece. Technology keeps marching on. I think even better than the previous design. 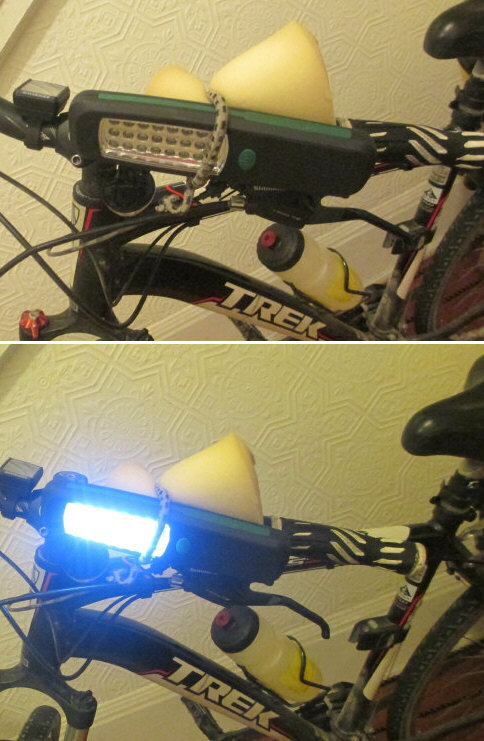 I retrofitted it with foam padding and a bungy cord to make a great bicycle headlight. No I haven't, but picture looks pretty interesting.